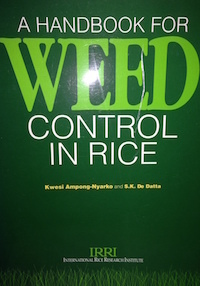 A handbook for Weed Control in Rice by Kwesi Ampong-Nyarko and S.K. De Datta. IRRI 1991; 113p. This book covers significance of weeds in rice farming, rice weeds of world importance, weed control, principles of herbicide use, principal rice herbicides, weed control in irrigated rice, weed control in rainfed lowland rice, weed control in upland rice, weed control in deepwater and floating rice and management of some difficult weeds.